A,B,C,D are four points which are not on the same plane. How many different parallelepiped can be constructed whose vertices are these points? Parallelepiped is a solid figure with six faces having all parallelograms. The points could form any of the following configurations of vertices of the parallelepiped. 1. One vertex A together with its three adjacent vertices B,C,D. There are $4$ choices of which point is the central vertex A. The three edge directions of the parallelepiped are then AB, AC, AD, the order does not matter. 2. Vertices A,B,C,D where AB, BC, CD are adjacent pairs and so form edges of the parallelepiped. 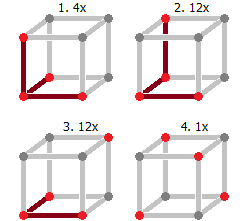 The four points can be labeled in $4!=24$ ways as A,B,C,D, but note that reversing the order gives exactly the same set of edges, so this leads to only $4!/2=12$ parallelepipeds. Above are the only cases where we have three edges amongst pairs of points. It is not possible to have four, as that would mean the points form a side and so lie in a plane. 3. One vertex A, two vertices adjacent to it (B,C), and the vertex D diagonally opposite vertex A (D is not adjacent to any of A,B,C). There are $4$ choices for which point is A, $3$ for which other point is D, and the order of B,C does not matter. This gives $12$ parallelepipeds. 4. Vertices A,B,C,D where none of them are adjacent. Here the label ordering does not matter as they are all equivalent. This gives $1$ parallelepiped. This gives a total of $4+12+12+1=29$ parallelepipeds. 96 (24x4) because any 3 points are in one plane and the other one is not. Therefore we can draw a parallelepiped with a base formed by the 3 points and the 4th point being the point of the parallel parallelogram. We can then use the forth point to draw a side from any of the fourth points forming the base of the paralleliped. So we need to calculate the combinations without repetitions of 3 out 4 which is 4x3x2 = 24 and then multply the result by 4. To make it easier to imagine, ABCD can form a tetrahedron. Every vertex of the tetrahedron can be a vertex of the parallelepiped. A parallelepiped has 12 edges. When we focus on one of the vertex of the parallelepiped, each of the three edges attached to that vertex determine four edges of the parallelepiped. Not the answer you're looking for? Browse other questions tagged geometry combinatorics or ask your own question. How can a 16-sided non-self-intersecting polygon be drawn on a 4-by-4 grid?